Traditional and original mountain folk music with 3-part harmony, fiddle, guitar, accordion, bass and hummel(a larger dulcimer) celebrating America's country, gospel and honky-tonk heritage. The Ramblers have been playing together in various combinations since the mid-70s. We used to play old songs on camping trips or on somebody’s back porch or sing three part harmonies in Brady’s kitchen where the acoustics are real good. We all wound up living in Austin, Texas at the same time and in about 1989 we decided to formalize our group and The Melancholy Ramblers were born. We’ve been playing gigs around Texas, New Mexico and Colorado since then. We were chosen to represent the USA and play the Concert for Peace in Potsdam and Berlin in 1991 after the wall came down. We got to play for Russian generals and their families along with representative bands from Germany, Russia and Turkey. The location for the concert was the auditorium at the former headquarters of the dreaded Stasi... the East German secret police. We played our favorite old songs like Long Black Veil, Muddy Water and Operator (Give me Jesus on the Line). I have to tell you that we received a roaring ovation and Gave Peace a Chance. Brady got a Martin guitar when he was a teenager and learned to play Hank Williams songs with his brother. He’s still got that rosewood Martin and it’s now considered a classic. That guitar must know a million songs. Brady had some time to kill in middle age and took up the fiddle. 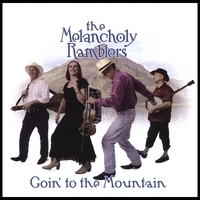 Now the Melancholy Ramblers feature that instrument and use it on all kinds of folk, gospel, Cajun and Celtic songs. Brady also learned to yodel by listening to Jimmy Rodgers and Kenny Roberts records. His versions of Cattle Call and Chime Bells always leave the audience elated. Frances grew up in a Czech family out in the country near Taylor, Texas and learned to sing in church. She has an amazing, powerful, soulful alto voice and people just love to hear her sing. She’s been a piano player since she was a girl but picked up the accordion so she’d have a transportable instrument to play with the Ramblers. Marco (your humble correspondent) got a dulcimer from a kit in the early 70’s and found the drone to his liking. Later on he discovered a larger version of the mountain dulcimer called the hummel. A hummel has more strings and is a German/Swedish cousin of dulcimers. The hummel sound has something in common with the bagpipe. In their spare time, both Brady and Marco are actors working in film, TV and on stage. Blackie White is the most recent Rambler. He started playing with us a few years ago and we liked what his bass added to our sound. Blackie is an incredibly versatile musician and in addition to his duties with the Ramblers, plays guitar for the Cornell Hurd Band. We believe that there’s a reason these songs have lasted. They hold the spiritual DNA of this country and we are very proud to play a small part in their preservation and celebration. We’ve also written quite a few songs in the spirit of these old numbers. Some of them are included on Goin’ to the Mountain. There are a couple of historical songs about the Civil War written by Marco and Brady’s great fiddle instrumental Frances Waltz that we play at almost every gig. Brady also wrote a song about trucker love called Angel in a Devil’s World and a hymn to the Grand Canyon. We hope you like them. The Melancholy Ramblers thank you for your kind attention.